CNC Swiss Turning - Cer-Mac Inc.
Our Swiss machines have the capability to do thread whirling operations. 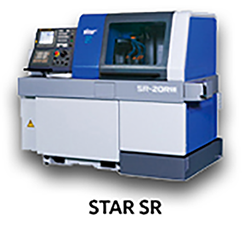 The STAR SB machine is designed specifically for whirling, with an inherent rigidity for cutting deep, wide profiles in tough material and accuracy for cutting precision, close-tolerance parts. Swiss machines have resulted in a renewed appreciation of the many advantages thread whirling can provide, especially in the machining of such hard materials as Inconel, titanium and the new stainless steel alloys. Cer-Mac has had experience in machining these particular alloys for years. Parts such as bone screws and related devices to customized fasteners for complex defense, aerospace and electronics applications, Swiss machining coupled with all our capabilities, Cer-Mac is sure to suit all your machining needs.